Since the school days, I was always interested in American cars. I did even subscribe to American car magazines to get a first hand information about these vehicles. But as a young man, just after I finished my education as a machine mechanic, there was not too much money available for an American car (my parents did never have a car). 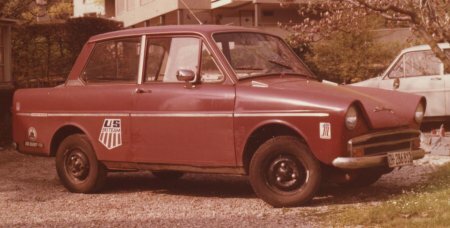 Therefore, my first car was a DAF with variomatic (automatic transmission). 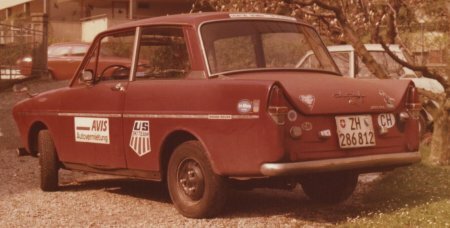 Of course it was not a DAF Truck because DAF made also small cars at that time. These were my only non American cars. Sorry about the low quality of the photos as these are old and faded prints which I scanned. This was my DAF no. 3 and behind is DAF no. 2 which went out of service. As you can see, I was working for AVIS rent-a-car and there is also a US Ski Team herald on the car. All in all I had 5 diff. DAF's. 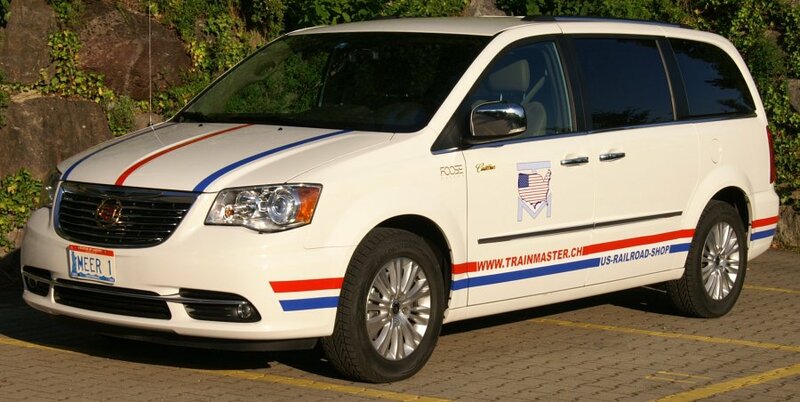 I used these as my every day car to go to work and later, I got my first American car. 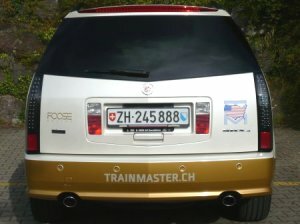 I have to explain the Swiss system of "exchange" license plates. Here we can have two cars with one set of license plates and just pay tax and insurance for the bigger car with the bigger engine. You can anyway only unse one car at a time. So, it was very easy to have two cars and pay for the bigger one. Therefore, I was able to have (aside of my little DAF) a big 1961 Plymouth Fury. After a couple of years it was replaced by a 1968 Dodge Charger R/T. 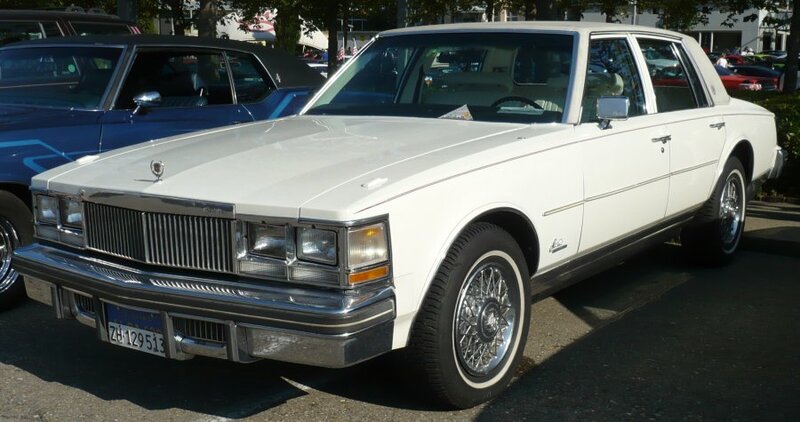 After 11 years, my Charger was replaced by a 1977 Cadillac Seville. Later I noticed a 1985 Pontiac Trans Am with German customs plate. It was direct imported from the USA to Germany and was now here in Switzerland. I was able to get at a real low price but it had to be equipped with Swiss legal modifications etc. 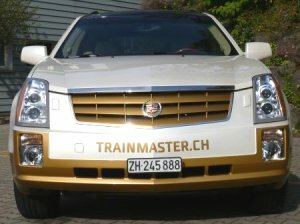 It was quite complicated and took 3 months until it made it through Swiss DMV control to become a street legal vehicle. In 1995 my Trans Am was traded in and replaced by a 1995 Cadillac Seville STS. With my last DAF (it was a DAF 66) I had a collission on the right side. So, I decided to buy also an American car for my daily driving as my other American cars are used for special occasions and nice weather driving, only. I got a 1981 Ford LTD Country Squire station wagon. After a couple of years, I got my first Minivan, a 1989 Chrysler/Plymouth Voyager (short wheelbase). 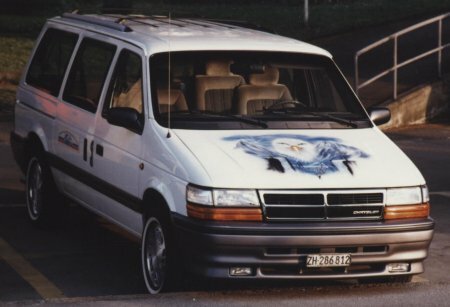 Soon, the extended wheelbase Voyagers have been available and I got a 1991 Chrysler Grand Voyager. It still had the heavy benches in the second and third row. Soon after, the Voyagers got single seats in the second row. The time has came to change the Minivan again to a 1993 Chrysler Grand Voyager. 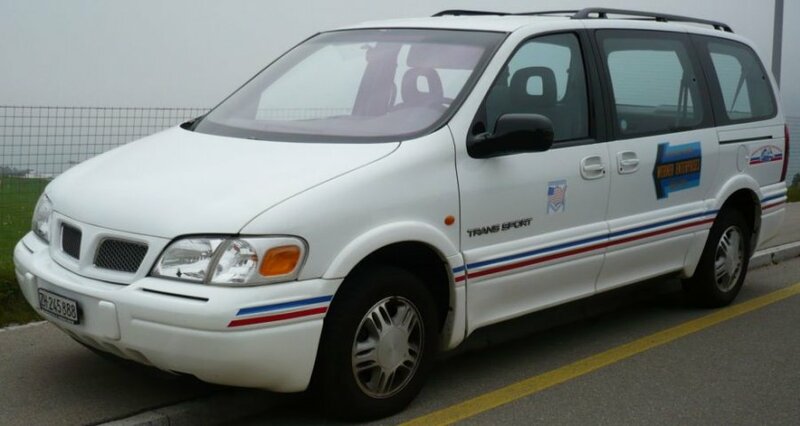 My next Minivan was a 1997 Chevy Trans Sport (actually a Pontiac) with 5 single seats in the rear. These lightweight seats were easy to remove for transportation of goods. Even the right sliding door was automatic. 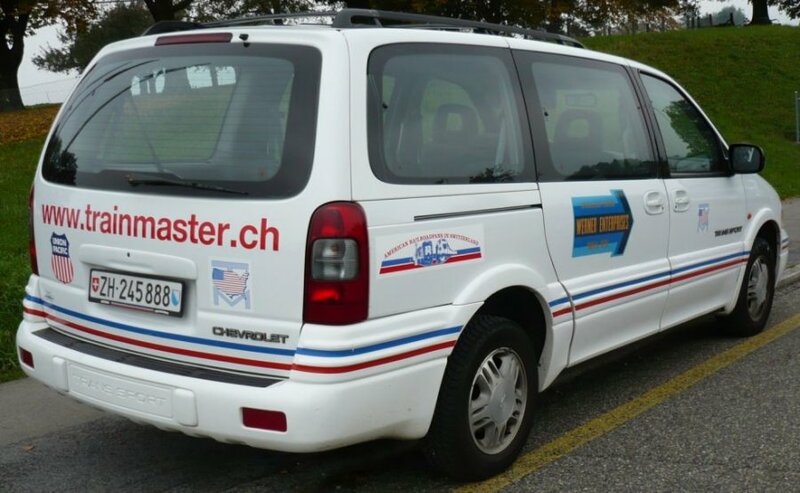 In Spring of 2013, I should pass DMV control and the repairs to fulfill the Swiss standards would have been too much to invest in a 16 years old car. So, I got a 2012 Chrysler Town & Country. As of being a great Cadillac lover, I customized this Minivan, removed all Chrysler letterings and replaced it by Cadillac lettering and Cadillac Crest logos. I found some old black & white prints which I scanned. From left: 1986 Pontiac Trans Am, 1977 Cadillac Seville, 1981 Ford LTD Country Squire. The front end of the Cadillac Seville and the Ford LTD have a lot of similarities even they are made from different companies. Ford LTD with my regular license plate, Cadillac Seville with special MEER 1 plate and Pontiac Trans Am with German customs plate. 1986 Pontiac Firebird Trans Am with 5,0 V 8 TPI engine 300 HP and auto trans. The color is red and silver below. 1986 was the first year with the third stop light. 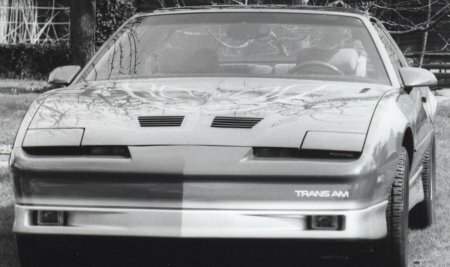 Who did ever expect that one day, this Trans Am would be replaced by another Cadillac, a 1995 Seville STS. Here are both cars side by side. 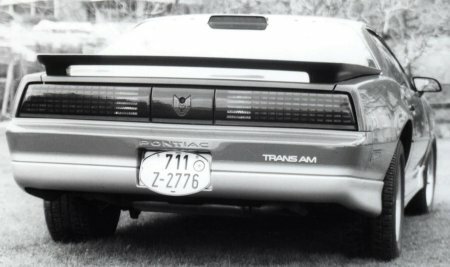 This Trans Am did replace my 1977 Cadillac Seville (see below). Well, this was my 1977 Cadillac Seville as the new owner is my former Garage at Langnau A/A. He is really taking care of this car. 1995 Cadillac Seville STS with 4,6 Northstar V 8 engine 305 HP in pearl white and natural shale interior. 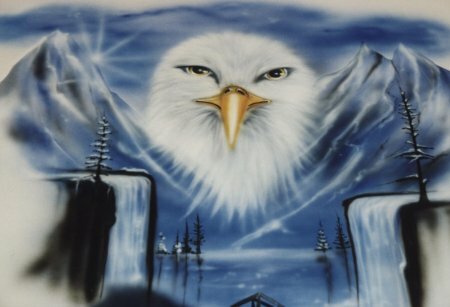 My 1993 Grand Voyager got an airbrush of an Eagle on the hood by Rolf Tiefenbruch. Hopefully, I can find more photos of my old cars. My first Minivan with single seats in the second and thrid row. Easy to remove for hauling cargo because they are lightweight. 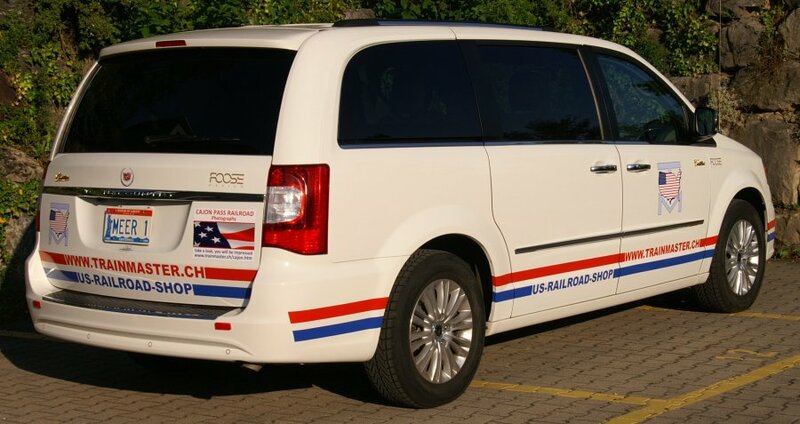 Actually a 2012 Chrysler Town & Country which was customized to a Cadillac Minivan to be the only one in town.